If you are worried, don’t be, I’ve not disappeared. I’ve just not posted anything for a while, but I’m frustratingly the same John as ever. Though with a beard, that is different! In the past I might have done quick posts on things such as the 2015 election which never happened here in Dulwich, apart from just 2 window posters, and our fraudulent system that allowed 1.5 million Scots to elect 56 MPs and 4 million UKIP voters to elect one (and I’m not pro-UKIP). Yes, I’m still angry at that, at least as much as one can be after being a supporter of PR since the days of the SDP, if you remember them. 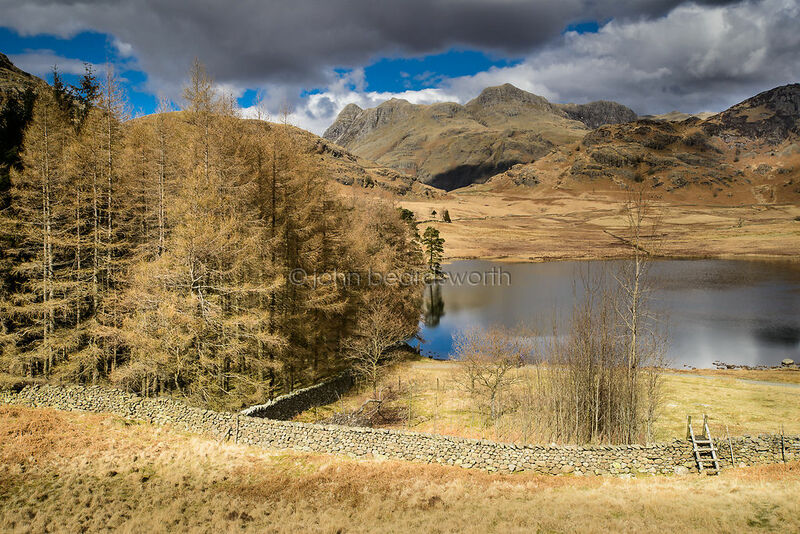 As for the photo, it was taken in mid March at one of my favourite Lake District locations, Blea Tarn in the Langdale valley. I’d been along the tarn’s shore, from where a million photos are taken, and as I was about to wander back to the car I had noticed the stile and behind it the rocky outcrop from where I took the picture. Usually at that time of year the lovely orange reds of autumn have gone and look dead, or the greens of an early spring have taken over, but the winter must have been pretty dry and everything was this lovely golden colour. What you don’t see is that for maybe half hour it wasn’t anywhere near as serene as it looks. Just after setting up my tripod on this outcrop, maybe 50 metres to my right a drone was buzzing up and down, its owner just playing with it as if it was the first time he’d used it. I don’t think he noticed me glowering in his direction, and how I wish I’d marched over and told him drones were banned in the national park (they may be in the US but not here!). The last thing anyone wants, someone droning on, eh?